For today’s class, we looked at the conclusion, or what really feels like the firework finale, of On the Origin of Species. Whereas the previous 480 pages are carefully, exhaustively, even at times hesitantly proposing natural selection and descent with modification, the conclusion changes in tone. Confident and assertive, the Darwin in the last chapter is equal parts preacher, prophet, and professor. Here in the last chapter, he finally uses the word “evolved”—which is also the ONLY time he uses it in the book. (The word “evolved” has only recently been meant as a stand-in for Darwin’s life work on natural selection and descent with modification.) Honestly, the last sentence is truly beautiful: “There is grandeur in this view of life, with its several powers, having been originally breathed into a few forms or into one; and that, whilst this planet has gone cycling on according to the fixed law of gravity, from so simple a beginning endless forms most beautiful and most wonderful have been, and are being evolved.” The crescendo of the building clauses, the careful use of passive construction so as not to say who (or what) is doing the breathing or the creating, and the strong stressed final beat of “evolve” all give this final sentence its glory. 1. Compare and contrast the first edition and the final edition’s last sentence. What was changed? What are the effects of those changes? 2. 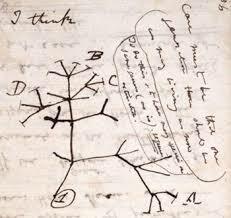 How would you characterize Darwin’s tone? How does he create that tone? When does he deviate it from it? 3. Consider how Darwin structures this book. He doesn’t begin with anything explosive, but instead talks about domestic animals and breeding them for certain traits as a way to make something unfamiliar, familiar. What if, though, Darwin would have begun with the conclusion? What effect would that have on the reader?